To help support the Custom Car Chronicle site we are now offering a new series of Art Prints of some very famous Custom Car Photos. From small size prints to floor to ceiling size Wall Art. 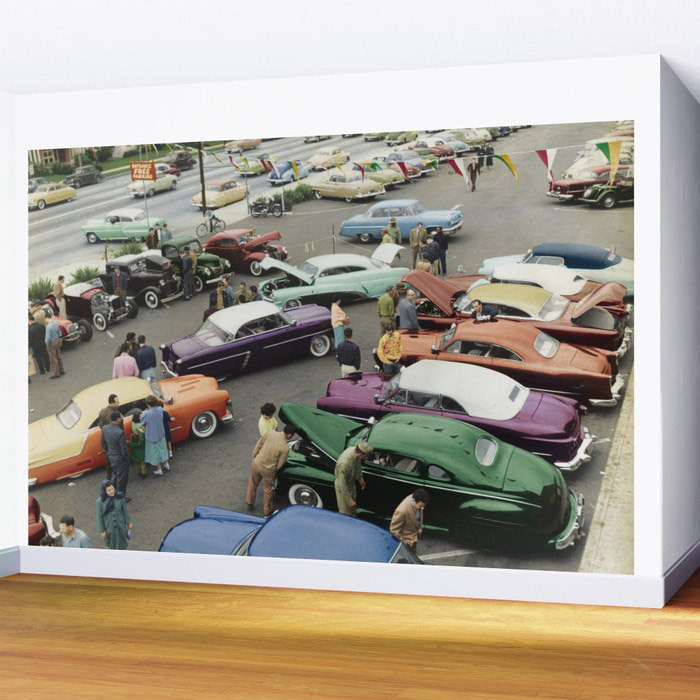 I have received quite a few request for wall size posters for the famous 1954 Thrifty parking lot car show photo that I colorized many years ago. We have had them available as photo poster for a few years, but some people would like to have them floor to ceiling size in their home or garage. Well good news for those people, they are now available for our new www.society6.com/customcarchronicle shop. I have been searching for a good place to offer these Huge Wall posters as well as some good quality Art Prints of some of the other colorized photos as well as regular Iconic Custom Car photos for some time. Recently I was told about the great products and service from Society6. 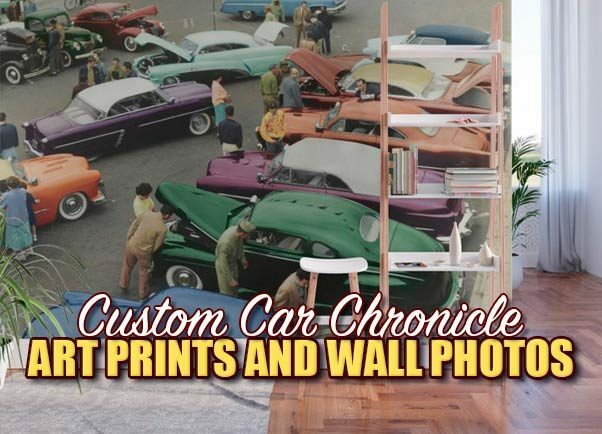 This is an business that produces good quality Printed Art and offers an individual online shop for customers, perfect for the product of the Custom Car Chronicle. A perfect way to help support the Custom Car Chronicle site. One of their great products are what they call Wall Murals, Huge 8 x 8 feet, or 12 x 8 feet Photo prints divided in 4 or 6 rolls of self-adhesive rolls. Which was perfect for what I planned to do with the Thrifty Parking Lot Custom Car Show photo. 1-Art Prints: Available in five sizes, from mini to x-large, Gallery quality Giclée print, Natural white, matte, ultra smooth background, 100% cotton, acid and lignin-free archival paper, Epson K3 archival inks for high-quality print. 2-Framed Art Prints: The frame is made of solid wood from socially and environmentally responsible forests. This framed art provides a minimal style that perfectly complements any design. Available in six sizes, in walnut, pecan or natural colors. Natural white, matte, 100% cotton rag, acid and lignin-free archival paper. Solid wood frame dimensions: 0.75” (W) x 1.25” (Depth). Gesso coating for rich color and smooth finish. Premium shatterproof acrylic cover. Acid-free dust cover on the back. Includes hanging hardware. 3-Frameless Canvas Prints: With edge-to-edge prints and a nice depth, they’re great for hanging or setting on any flat surface. Available in three sizes. Bright white, fine poly-cotton blend matte canvas. Printed with the latest generation, long lasting Epson archival inks. Hand-stretched wrap over 1½” deep wood stretcher bars. Individually trimmed. Includes hanging hardware. 4-Wall Murals: With these Wall Murals, you can cover an entire wall with an Iconic Custom – just line up the panels and stick them on. They’re easy to peel off too, leaving no sticky residue behind. With crisp, vibrant colors and images, this stunning wall decor lets you create an amazing permanent or temporary space. Available in two floor-to-ceiling sizes. Size in feet: 8’ Mural comes with four 2’(W) x 8’(H) panels. Size in feet: 12′ Mural comes with six 2’ x 8’ panels. Printed on self-adhesive woven polyester fabric panels, easy to stick on and off. Matte finish and texture. Features vibrant, water-based, non-toxic inks. Washable with mild soap and water. 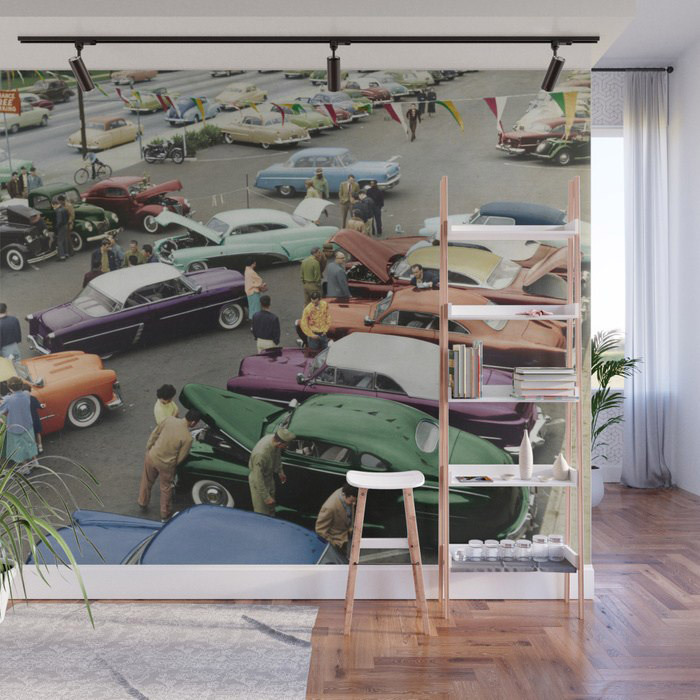 Below are the Iconic Custom Car Images that are now available at our new Society6 Shop, some of these are available as Art Prints all the way up to Wall Murals, while others did not work on Canvas or the super large Wall Mural and are only available as Art-Prints. If there are any images you would like to see part of this series, drop us an email, and we will see what we can do. These posters are manufactured in the USA and also shipped from the USA. At this point I’m testing the waters and see if there is enough demand for these Huge Posters, as well as the new art prints. If there is, then I will also see if I can create similar products in Europe for the European customers. Until then, these prints available for Word Wide Shipping, but keep in mind that there might be an additional import tax when ordering outside the US.